Have you noticed something about the breaking news coverage of Brexit over the past week in America, and I suspect across most of the world outside Britain? Beyond the headlines – “Biggest Defeat Ever for May,” “May Not Removed As Prime Minister, But No Plan B” – there was not much analysis of what is going on. The reason: Brexit is so complex, so riddled with jargon, and so uncertain, that most media have chosen not to go down the rabbit hole. Here is my attempt to analyze what is going on, in as simple terms as I can, using as little Brexit jargon as possible, decoding it where necessary — and ending with a couple of predictions. Here’s one obvious prediction: More damaging uncertainty ahead. And one conjecture: BINO – a Brexit, but in name only. But her deal only expressed hopes for what happens after that, for the future of the U.K.’s relations with the EU. The core unresolved issue is this: Britain wants continued free trade with Europe while (re)gaining the ability able to cut its own trade deals with other countries. On its face, this is a big no-no because it violates the central tenet of the EU’s “customs union.” Unless and until the EU accepts this (and there is not only no guarantee but also little realistic prospect that it will), the EU is insisting on a “backstop” – keeping the U.K. in the EU customs union to avoid renewing border restrictions on people and goods between Northern Ireland (part of the U.K.) and Ireland (a committed EU member). Many believe this is essential to maintaining peace on the Irish border. But the Brexiteers consider it an indefinite, and potentially permanent, violation of British sovereignty that undermines the whole idea of Brexit. No deal: If May’s deal – or some modification of it – is not approved by the British parliament by March 29 this year, this would trigger the ultimate “hard” Brexit. Britain would no longer have to abide by any EU rules. But its access to Europe would be no better than any other country that has no treaties with the EU. For diehard Brexiteers, this is victory – Britain regains full sovereignty and is then free to cut trade deals with the U.S. and other countries. Everyone else calls this “crashing out” of the EU, with myriad devastating consequences for Britain, including an immediate and potentially long-lasting recession. Revoke Article 50: If May cannot get a deal (any deal) through her own parliament, the clear alternative to avoiding a no-deal Brexit would be for the U.K. to revoke Article 50 of the EU treaty – that is, to call a complete end to the whole process, and to revert to the status quo of U.K. membership in the EU. While May has the formal power to revoke Article 50, she only became prime minister by promising to deliver Brexit. Giving up would mean she would have to resign, and who knows what would happen then? British voters: The Brexit referendum in 2016 was close – 52% to 48% in favor of leaving the EU. The social divisions look very much like those over ‘Make America Great Again.’ The pro-Brexit coalition was older, whiter, less educated and living outside London and other major cities. Remainers were younger, more multi-ethnic, better educated and more urban. In the two and a half years since the referendum, public opinion has slowly drifted away from Brexit – as the challenges and consequences of actually leaving the EU have become more apparent. But today, the options facing the public are more complex (though maybe more realistic) than the simple stay/go choice in 2016. While voters remain deeply divided, according to the most recent polling the most popular, least-worst outcome is holding a second referendum resulting in a vote to remain in the EU (36%). 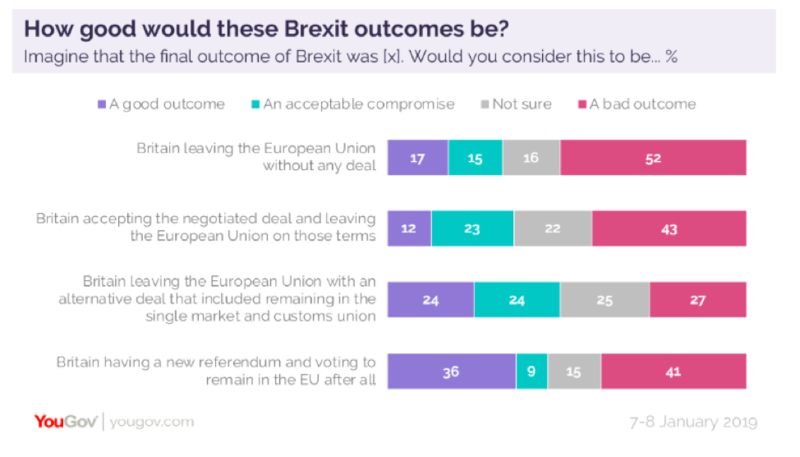 But more people (41%) think this is a bad outcome (the only worse one is a no-deal Brexit). Suffice it to say, the British public remains deeply divided on Brexit, and the proliferation of potential pathways makes it very hard to find solid majorities for anything. The EU: All 27 other member countries in the EU have to agree to any exit deal for the U.K. Rather than having each country negotiate for themselves, the EU has centralized this – allowing Brussels to negotiate on behalf of all 27 capitals. This is why the EU says the May deal is the only possible deal. Otherwise everything would be back to square one. Stepping back a bit: In 2016, the EU did not want the U.K. to leave, for myriad obvious reasons. More than two years later, many in Europe are fed up with Britain, and they want to make an example of it. Bottom line: Any attempt by Britain to strike a fundamentally different deal from May’s will be a) very hard and b) take a long time. That means nothing much is likely to happen as the clock ticks towards March 29. Revoking Article 50 would repudiate everything May has stood for as Prime Minister. So the only way that could happen would be if she is removed as Prime Minister, by her own party – but her party’s rules currently make this impossible. In any event, a rupture inside the Tory party would likely trigger a British general election, which in turn would inevitably raise the specter of a second Brexit referendum. As a result, the most likely short-term outcome is “kick the can down the road” – Britain asks for, and the EU agrees to, an extension of the Article 50 deadline. But for how long? It took May and the EU two-plus years to agree to a deal and then only a few hours for the British parliament to tear it up. Since Labour wants to win the next election, it won’t support the Tory government on any go-forward plan – under any circumstances – because this is their path to government. The hardline Brexiteers really might think no deal is the best Brexit. It is hard to see how these British political dynamics would change with an extension to the deadline. Knowing this, why would the EU agree to give Britain an extension? Because a no-deal Brexit would be a disaster for Europe, too. Second, a conjecture: At the end of the day, a soft Brexit will win the day because it commands clear majority support in parliament and is the plurality winner in the electorate. That is why I believe the ultimate outcome will be BINO – Brexit in name only. I just don’t know when Britain will get there. I suspect it will take years, not months. Brexit policy wonks are calling this outcome “Norway” or even “Norway+.” Decoding what that means is for another day. But the hint is this: Norway wanted both sovereignty and to be part of the EU market (as the U.K. does). Norway was willing to pay a very high price to get both. I suspect ultimately the U.K. will have to as well. A no-deal Brexit has investors rattled, because it could disrupt supply chains and cause economic and political chaos, warn experts. Theresa May’s Brexit action plan won’t find favor with either the EU or her own party, and she faces tough times ahead in negotiations, say experts.